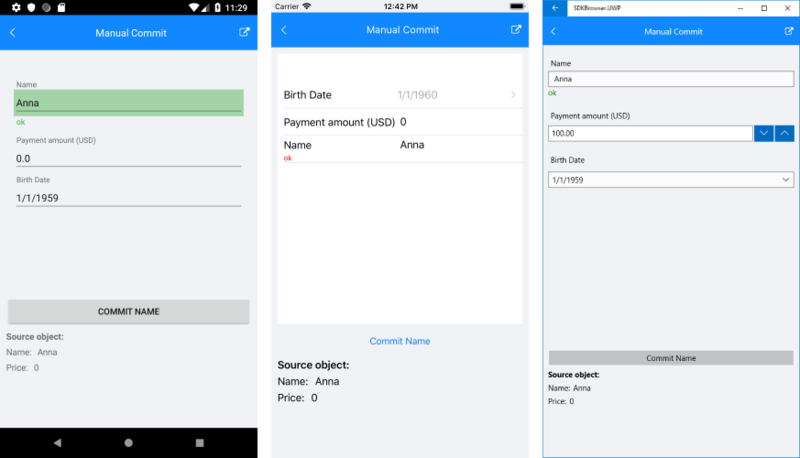 RadDataForm for Xamarin provides built-in validation, which gives you full control over the data collected through the control. You could specify the validation rules for each property of the source object through Validation Annotations. The next sections list all DataForm members related to validation. Immediate: Property value is validated after every change in editor. OnLostFocus: Property value is validated after editor looses focus. Manual: Property value is validated only with explicit call of a validate method or on commit. The selected mode is applied through ValidationMode property of the DataForm control. ValidateAll(): Validates all properties and when finished, raises the FormValidationCompleted event. ValidateProperty(string propertyName): Validates the property with the specified name and when finished raises the PropertyValidationCompleted event. You can use the validation events below to get notified when RadDataForm has validated its fields. FormValidationCompleted: Occurs when all form properties are validated. Provides a list of failed properties. PropertyValidationCompleted: Occurs when a property validation has finished. Provides information about whether the property has passed validation. The example below shows how you could use Manual ValidationMode with RadDataForm. The values entered in the DataForm can be submitted to the underlying data object on three different occasions, using the CommitMode property of the DataForm. Immediate: Property value is committed after each change in the editor. OnLostFocus: Property value is committed after editor looses focus. Manual: Property value is committed only with explicit call of commit method. The selected mode is applied through CommitMode property of the DataForm control. CommitProperty(string propertyName): Commits the property with the specified name. All commit methods call validation first. If the property value passes validation, then the corresponding validation finished event is raised and the value is committed successfully. The example below demonstrates how you could utilize Manual CommitMode and CommitProperty methods. Let's use the same User object from the previous Validation example. You could submit the entered "Name" value like shown in the snippet below. The image below displays RadDataForm with submitted "Name" property. 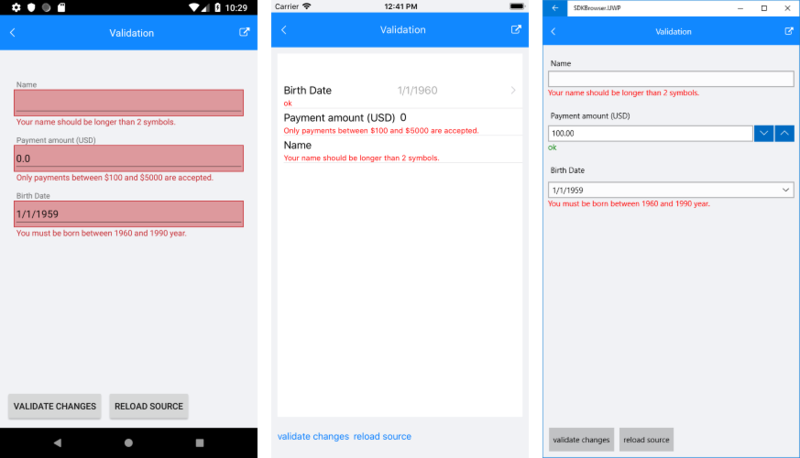 Sample examples demonstrating validation and commit features of DataForm control can be found inside the RadDataForm -> Commit/Validate section within the SDK Samples Browser application.